So if your children are anything like mine, the minute they even remotely see anything that resembles a vegetable, or something that is actually good for them, it’s gotta go! Marshall do you like broccoli? I see on Facebook all the time, all these post about people’s children munching on kale for snacks and what not… and here I am sitting like “teach me your magic ways, oh wise one”. I don’t know how they do it. My kids act like I’m trying to kill them, if I even present a vegetable on their plate. Do you like broccoli? I don’t understand it! My son used to down veggies and fruits like they were going out of style, he usually left things like meat on the plate. Now I’m lucky if he’ll even eat at all. “It’s a stage.” I know, but sometimes I just want to make sure he gets something that resembles a healthy meal into his system. Much to his surprise you cannot live on Goldfish. So enough’s enough, it’s time for something drastic. I keep “seeing” all these hidden veggie recipes on Pinterest and they just sit there on my boards. So I am deciding to try them. 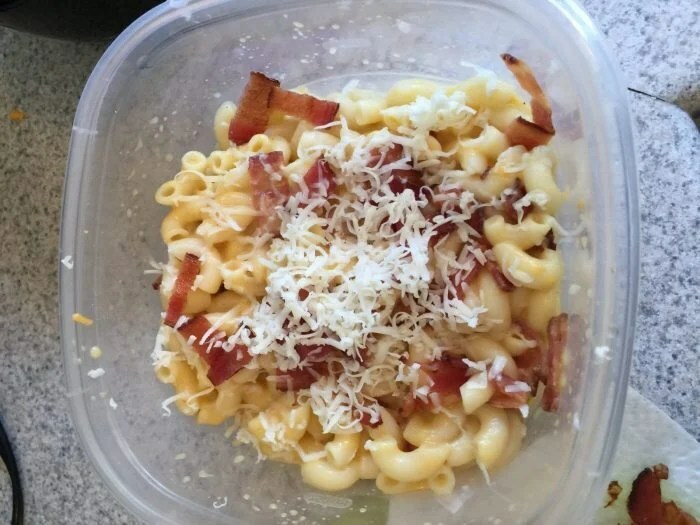 This recipe is for a Butternut Squash Bacon Mac and Cheese, and boy did it ever turn out good! Both my son and my husband had absolutely no clue that the whole base for the pasta was actually a veggie! WIN! Come on anything with cheese and bacon is going to please, so I was thrilled when it was downed in seconds and something that will be requested again! Happy wife, happy life and a happy tummy = a very happy Mommy! This recipe was so deceivingly good, no one knew it was made from veggies! 2 table spoons (on the larger sides) of margarine, you can use butter if you prefer. What ever you have on hand works. 2 cups of your choice of cheese. I used extra old marble cheese. 1 pack of bacon. (we LOVE bacon) You can use less if you prefer, the result will end up the same! Throw your Macaroni on boil. Drain and set aside in a casserole dish. Boil your butternut squash until it is tender and cooked, for me this took as long as the macaroni. Cook your bacon until extra crispy (or your desired amount) I used the oven method for cooking, and crumble. Place your cooked squash into a blender with your scoops of butter, lots of salt and pepper. blend until you get a nice and creamy texture. Add your cheese to your sauce and stir until melted. Pour sauce over your noodles and add half of your crumbled bacon. Stir. Added a bit of extra cheese and the rest of your bacon to the top of your dish. Heat in a 350 degree oven for 5-10 mins, or until hot and the cheese on top is melted. This recipe sounds very delicious. The men in my house would love it. My daughter loves veggies, but I’d like to try this anyway! (We don’t eat bacon — but that’s easy to change.) Thank you for sharing! I absolutely am loving this recipe! Thanks so much! I’m gonna try it on my family this weekend! I made this recipe one night and I didn’t say a word to no one, they all said there was something different but couldn’t figure it out and I didn’t tell them either, but they still ate it and that’s all that matters!! I love Mac and cheese. The recipes sounds delicious. I will have to try this. Looks delicious!! Getting my boys to eat veggies is impossible but my daughter actually loves them! At supper I have caught my boys passing their sister al their veggies!! This recipe sounds delicious and easy to make! Thanks for sharing! This is brilliant! Going to have to try this recipe on my kids. Thanks so much. Great ideas for concealing nutritious veggies. What a great idea to hid some squash in it! I think I am going to have to give this a try, thanks for sharing it! I am going to make this asap!! We love squash at our house so this won’t be a problem for me to try and hide. Good idea though and it looks so delicious!! this is genius!!! My girls live off of macaroni. They are picky eaters so don’t get their veggies this is the best of both worlds all in one dish. fantastic ! My little guy really loves mac ‘n cheese as well as squash so I am definitely going to try this recipe. I love hiding veggies in sauces and such, such a great way to get some nutrition in! Looking forward to trying out this recipe! I love the idea of putting butternut squash in this recipe. Sounds great! Sounds scrumptious , thanks for sharing the recipe , a must try ! I love bacon a well. I could see this recipe working well. Thanks for this recipe – looks delicious and a great way to use up all the butternut squash at this time of year. thank you for the healthy recipe!! I’m not a big fan of squash but this is a great way to disguise it so even I couldn’t notice it. This sure sounds like a delicious dish! A great way to get something healthy to your mac & cheese!